Are you trying to find the best portable basketball system that is available in the market? Do you want to buy one that is able to promise good quality and value for money? If such is the case, there is no doubt that the right choice for you is the Spalding “The Beast” Portable Basketball Hoop, which has been asserted as one of the toughest models available today. Indeed, it was able to live by its name, showing how a beast it can be. One thing that contributes to the professional quality of this basketball system is the 60-inch glass backboard. Considering that it is made for residential use, the backboard is fairly large, and can in fact be one of the largest within the product category. It is also a good thing that it is made from glass, making it comparable to those that are used in professional basketball leagues. It comes with a 50-gallon capacity base that you can fill with either sand or water. This provides the stability that is needed to keep the hoop in a straight position and to avoid making too much vibrations during games. The unit also has a four-strut pole that provides additional stability and rigidity. This provides sufficient support to the entire system. Designed with a Pro Image breakaway rim, it is apparent that it is made to withstand dunks. The rim makes it able to handle pressure from intense shots and allows it to revert to its original shape afterwards. The rim also has an all-weather nylon net. This makes it able to resist various external conditions that could have been damaging to its quality, especially when used for a long time already. With the basketball system’s multi-wheel design, it will be effortless for you to have the goal moved in a different location when needed or when preferred. This is highly recommended for those who are unsure as to where a basketball system will be placed. This should be also bought by those who often move from one home to another, as the portability of the unit will allow you to bring it along in different places with ease. 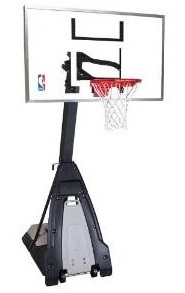 Lastly, this should be also bought by those who love to dunk as the rim is built to withstand powerful shots. Staying true to its promise of delivering high quality basketball systems at the comfort of your home, Spalding has once again proven with this model that it is still one of the best names in the competitive landscape. The Beast is a portable basketball system that stands out from the rest. It will allow you to play like a pro with a hoop that is convenient and economical.